Read more about the 3 phases of our CiTyBee prototype in Hedehusene (by clicking on the 3 phases). The process was very close to how we want to work in CiTyBee – testing ideas or prototypes, presenting them and discussing them and quickly use the new inspirations. The name CiTyBee came as a result of writing the short and condensed text for the Knight Newschallenge where we wanted “Make the urban qualities of the Internet – creating new networks, ideas and initiatives – interact with urban space to empower local communities”. We called it a Community Tool Box or CTB in short. We got inspired to apply for money from the Knight Foundation after we saw that they funded one of our favourite Map designers from Stamen and their project CityTracking. The Name CiTyBee (and it is a coincidence that the people in Minsk used the name Citydog) came after attending a workshop (by friend and collaborator Joachim Hamou) on agricultural production in Denmark and one presentation was on bees in the city and how bees in the big perspective speeded up evolution by cross pollination. Without going too deep into the analogy we thought our CiTyBee had enough of the same role in an “urban evolution” to use the name. We started our work in Hedehusene in the beginning of April after preparing our tools like the street kitchen, stickers and street whiteboards. Our debut would be at the local market, Hedemarkedet, that we had been involved in initiating a couple of years before. Our big map with stickers on that documented the stories people told worked well as did many of the other tools we tried for the first time. We still would be invited to present in various conferences like “Negotiating (in)visibilities in Copenhagen and in Helsinki where the topic was shorelines of the city. 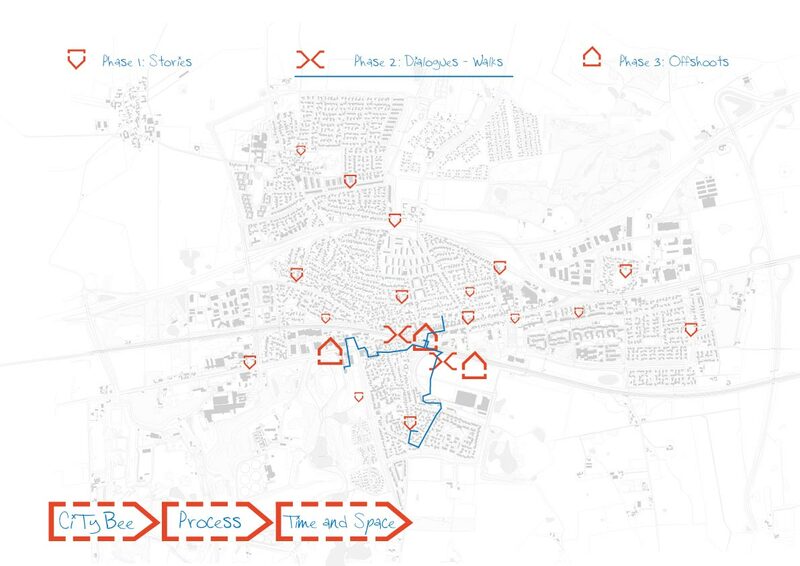 These presentations was still discussing the ideas of urban mapping but when we invited to Vienna for a workshop in the Underconstructions network in may we had enough material already to present the first phases of CiTyBee. The workshop was followed by another event in Venice as part of the Biennial, where the publication “My Favorite Rule” was published. Finally we were asked to present CiTyBee in Paris in October at the conference “Alter Architectures” where it became part of the discussion on EU architecture policy. Our formal task to map the “Intangible industrial heritage of Hedehusene” resulted in the rather thorough report that was used in a process we were not part of. As such our wish to make the talk more concrete were only partially possible – building with the young boys in a garden as part of a public meeting – and we were lucky to get another job that picked up on the ideas from the public meeting, making the local train station into a “project house”. This allowed us to work more on the actual building and design as a result of the participatory process. Ideally these elements would be more overlapping having a level of porosity that would allow building activities as a part of the storytelling and especially building prototypes as part of the discussion phase. The intensive (and too short) period of making “offshoots at the Station” slowly made the station more functional (and beautiful) parallel with the process of attracting new users and organising these. CiTyBee is no longer an active website except for the updates in the blog. CiTyBee was a concept developed to be a Community Tool Box based on especially a number of projects in 2012.